A good ice breaker can help you make a memorable first impression and turn an online encounter into a real-life relationship. A bad ice breaker can be boring, confusing, awkward or send you viral for deeply embarrassing reasons after the recipient posts a mocking screenshot on Twitter. So, how do you start a meaningful conversation with a match that avoids uncomfortable silences or public shaming? Bumble is here to help with a new Convo Starters Generator and a Convo Starters messaging feature. The Convo Starters Generator, now available on Bumble’s The Beehive blog, helps women make the first move by suggesting opening lines based on personality type and interests. Start by choosing which of Bumble’s three modes you want to use - Bumble Date, Bumble BFF, or Bumble Bizz. The generator then updates to reveal sliding scales or check boxes with information relevant to the mode you selected. The Bumble Date tool asks users to indicate which traits are more important and less important in a romantic match by sliding a scale left or right. The options include Humor, Ambition, Adventure, Honesty and Kindness. After making your selections, Bumble reveals your dating style and a selection of conversation starters tailored to what you’re looking for in a partner. The Bumble BFF generator takes a similar approach. Toggle to Bumble BFF mode and you’ll be asked to use a series of sliding scales to rank which parts of life are most important to you (Travel, Health, Social Life, etc). The generator uses the information to assess your friendship style and suggest conversation starters designed to reveal shared interests with platonic matches. If those ideas aren’t enough, Bumble has also introduced a Convo Starters feature on the in-app match screen. Swipe until a mutual match is made. From the match screen, tap the blue icon to reveal 20 ice breakers Bumble calls its “foolproof first moves.” Choose one that speaks to you and use it as-is or edit it to make it more personal before hitting send. 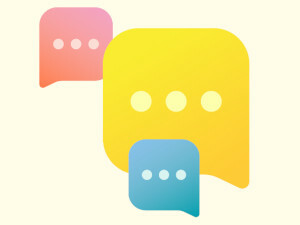 If none of the options tickle your fancy, you can minimize the screen and click again to generate 20 new Convo Starters. Convo Starters are available whenever you need inspiration to get the ball rolling. Simply open the chat and select the blue 'Need a good opener?' ribbon any time you want to see a list of ice breakers again. For more on this dating app you can read our Bumble review. This is where Bumble really fails. First, just because the owner is a forward and assertive female it doesnt mean all women are. In fact studies have shown most women expect the "man" to initiate the conversation. Even on Bumble I have seen many women refer to that. Also, when they do finally take the initiative to reach out, its usually 5 words or less with no thought put into it whatsoever. This is highly contrasted by the fact that women expect men to read through their whole profile and come up with a witty, charming, and thoughtful opener or they wont even bother. Ladies, Im all for equality but you cant have it both ways. You need to start acting as an equal and "Practice what you preach". Bumble needs to start promoting and marketing on a constant basis that women need to make the first move. Otherwise, whats the point of me even selecting someone? The way it is now I just post my profile and essentially wait for a response.